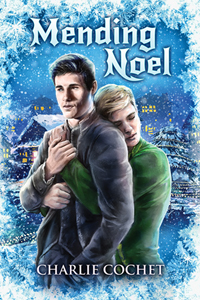 Mending Noel has a new cover! Plus a giveaway! Hello, all! I'm super excited to reveal the shiny new cover for Mending Noel, book 1 in the North Pole City Tales series. I love the original cover, and it was a perfect fit for my little holiday story in Dreamspinner's 2012 Advent Calendar, but once the world of our beloved Christmas elves expanded, bringing us a series with covers created by the awesome Paul Richmond, I really wanted Mending Noel's cover to match the rest of the series, so Paul gave Tim and Noel life! You'll find a little giveaway below to celebrate!